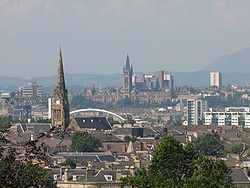 It was the morning of the 5th of November 2008 in Glasgow, and I had stupidly forgotten to shut the windows of my 5th floor room in Andre Ure Hall, a habit I had picked up from my home country (Nigeria) that served no use in Scotland except to freeze yourself to death. The rain and blowing winds that was synonymous with this part of the world at this time of the year was in full display. I got up hurriedly to shut the windows as the rain had started to sip in. The metal-framed windows protesting with a cranky noise, cursing under my breath as I slammed it shut. Instantly springing to mind was the high international student fees I had had to pay to get here (University of Strathclyde), surely that had to have been in respect to the facilities in the department, which was in complete contrast to those in the living quarters. The room came with a single bed that put an emphasis on the word “single”; I could barely fit my entire 6ft-1nch frame into it but I had somehow managed to do just that for the past 4 weeks. Wriggling and trying to negotiate my way to a comfort spot underneath the covers I couldn’t help but notice the obtrusive blinking red light of my blackberry, indicating 8 unread messages and 12 missed calls! Mostly international calls from my ex colleagues, I had turned my phone to silent mode right after the announcement and gone straight to bed. I had been following the results online till the wee hours of the morning. This had been a long and hard fought battle. It all starts to come back, the pronouncement, the victory speech… all felt a little surreal. Going back to the last six to seven months, all the talk and attention this particular contest had attracted was like no other. Everywhere you went everyone seemed to have his or her own distinct opinion. Lunchtime at the office was a cacophony of noise, everyone voicing their opinion on the issue that had dominated the news for the past couple of months, Charles was usually the loudest so never had any difficulty in making himself heard, his booming voice could be heard at all corners of the lunchroom, he would usually start by addressing me- his antagonist in chief on this “small” political matter, “Isi how long have you been following politics? If you have any experience in these matters, there’s no way in hell you’ll keep saying these things” my response curt and cheeky “well I’m not in the same age bracket as Wolf Blitzer (CNN political anchor The Situation Room) unlike some of us” in a jibe aimed at him, the fact that Charles was a lot older than the rest of us in the department was a running joke within the unit, hence my response was greeted with an uproar of laughter. Then it was usually Tinuke’s turn to have a go at me, she like Charles never shied away from airing her views. Her small frame a direct contrast to Charles’s couldn’t resist the temptation to chip in with her own opinion, and her high-pitched voice always seemed to go up an octave or two with each sentence “Isi ‘s optimism in this matter is hovering on delusional!” another octave up “As someone that has lived, schooled and worked in the states-I can unequivocally tell you that you are wrong“. somewhere had an opinion on the events taking place in American politics. The buzz of the elections was everywhere; the spotlight was on the American electorate. Which way where they going to go? The rhetoric was ubiquitously stale to my ears, first it was between the 1st female president and 1st black president… the hysteria on the gender and race of the contestants had somehow managed to circumvent the issues raised in their manifestos. Without trying to downplay the significance of a 1st female or black president, still I felt it was a huge disservice to one of the most fiercely contested and best ran campaigns by both contestants to base the race solely on that. Two people with remarkable IQs and a grand vision for the country they called home. Yet I could still hear the “no black man in a white house” jokes. Just wrong. Now after all the months of campaigning, mudslinging, and negativity to hear those five words. Those five words that will forever be echoed in remembrance of a day history was made, those five words that give me confidence in the fact that if I worked really hard at anything I’m in with a realistic shot. Those five words “change has come to America”. Till this day I ask people what they felt in that moment when they heard those words reverberate from their TVs, radios, or PCs? The answers I receive vary from euphoria to utter disbelief.